Each morning, A wakes up in a different body. There's never any warning about who it will be, but A is used to that. Never get too attached. Avoid being noticed. Do not interfere. Every single day, A wakes up in a different body. He never knows whose body it will be and there doesn't seem to be any pattern. All A knows is that the person will be the same age and in roughly the same location each time. A has a set of rules - don't make connections and don't do anything significant that could effect the real owner of the body. But then A meets Rhiannon, a girl he wants to be with forever. But is that possible, when he becomes a different person every day? 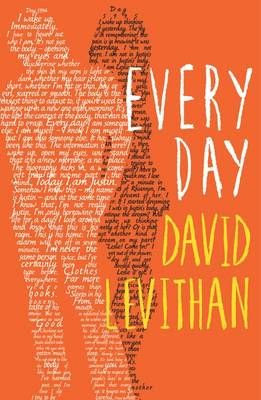 This is yet another remarkable novel from the very talented David Levithan. Sometimes I'll read a stream of YA books and think 'They're all kind of the same, in one way or another' and then I come to a book that is completely different from the rest. Every Day was that book. Every Day is thought-provoking and original. In fact, it's almost like a series of short stories because we 're constantly seeing life through a different pair of eyes. However, I did have one problem with the book. I didn't feel like I could relate/empathise/connect with A because he was constantly changing. A doesn't have a gender, family or a body of his own, so that was a bit strange but the good elements of this novel made up for that. Levithan is the master of creating original scenarios and compelling plots - I really don't know how he does it! A lot of people refer to him as a genius and I completely agree with them. I devoured this book in just a few hours. Every Day isn't perfect - I had a couple of faults with it - so unfortunately I can't give it my highest rating. However, 4.5/5 is a high rating anyway and I'm really pleased I was able to give it that, at least! If you buy this book, I highly doubt that you will regret it. Thought-provoking, original and compelling! I'm so glad you also liked Every Day. It is such a wonderful and I also loved it! Yay! Glad you enjoyed this too :-) So jealous of your phone interview with him! I have this sitting on my shelf waiting for me. I'm a bit nervous to start it though as the hype surrounding is immense. One of my fave books from last year. I hear there is a companion novel coming out from Rhi's point of view too! Can't wait! Other than the disconnection from A, this sounds like such a magical book! The concept is fascinating and I can't wait to read this for myself. I am currently reading Every Day, I'm almost halfway through it and so far I'm really enjoying it. Like you said it's hard to connect to A but in a small sense I can just a little bit. I understand he/she is sad because A doesn't have a life to call their own and I can't imagine feeling like that. Thanks for the awesome book review I look forward to reading many more.